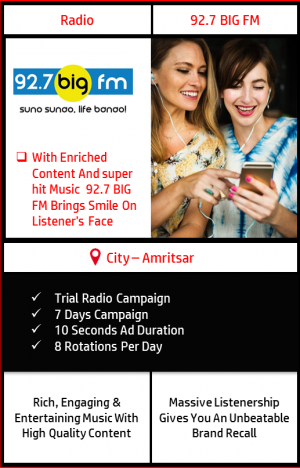 Advertising Medium – Radio Advertising On 92.7 BIG FM, Amritsar. Trial Radio Package With 10 Seconds Ad, 8 Repetitions Per Day, 7 Days Ad campaign. 10 Associate Sponsorship Tags As Pure Value Addition With The Campaign. Quality Voice Over Ad Absolutely Free With The Package. Highly Recommended Package By BMK To Try Radio Specially For The 1st Timers. Radio is present everywhere, be it your work space, home, travel time etc. Hence, connects & entertains your target audience almost everywhere they go. Radio gives your brand a local touch. The local RJ’s are none less than celebrities in their region & helps connect your target audience emotionally. Comparatively Less Ad Avoidance: Low Ad Avoidance as compared to other medias. No charges to listen radio: People don’t have to pay to listen radio, that’s why it is most preferred by everyone. Strengthen the campaign: Plays a valuable support role as well & helps strengthen your campaign on other medias. Mass publicity: Reaching masses is a major challenge for the advertisers. Radio effectively helps your brand reach masses. Flexibility: Unlike so many other mediums,this medium is quite flexible in nature and helps you make customized on & off ground integrated campaigns as per the brand requirements. Wide reach: Suitable to reach out to a small geography as well as complete country. 92.7 BIG FM is India’s largest radio station which is spread across a wide area. In India approximately 4.2 Crore people are targeted by BIG FM in a week. This radio channel created history by launching 45 radio stations in a short time span of only 18 months. With the best RJ’s and Super-hit music, BIG FM target a massive audience including mid night shows. Huge network ensures your brand reaches to the huge masses. 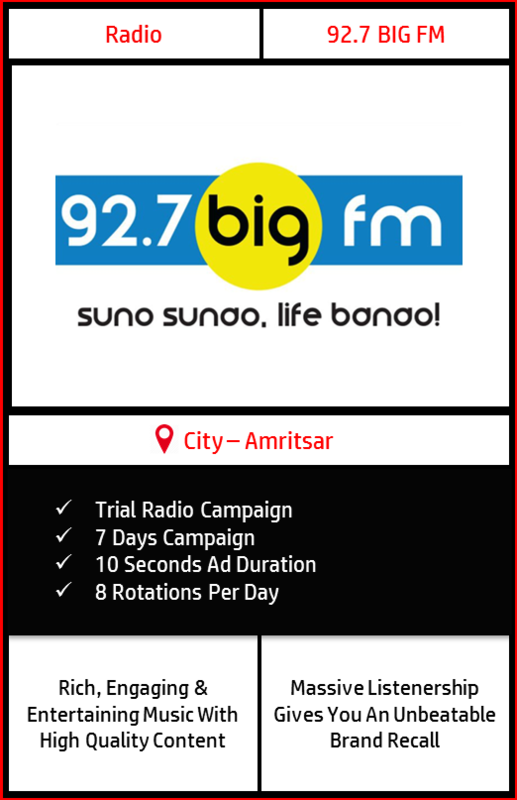 8 rotations of 10 seconds each would be played per day consecutively for 7 days on 92.7 BIG FM, Amritsar. Value Addition: 10 Associate sponsorship tags are offered with the campaign. Broadcasting report would be shared after the end of the campaign within 30 days. Quality voice over radio ads would be produced by BMK only. 34% spots in the time band of 0800 Hrs. – 1200 Hrs., 33% in time band of 1200 Hrs. – 1700 Hrs. & rest 33% spots in time band of 1700 Hrs. – 2200 Hrs. on RODP basis. Spot duration is flexible and can be changed as per the requirements of the campaign while overall seconds in the campaign would remain the same. There can be slight deviations in the above plan with respect to inventory availability, on the spot terms & conditions of the FM Channel at the time of booking. GST of 18% as applicable is extra.